Although not exactly a new concept (cave men were eating it, after all), bone marrow exploded onto the foodie scene in the UK in 1994 when Fergus Henderson started serving it at his Clerkenwell restaurant St. John. The simple signature dish serves roast veal bones (which have a more delicate flavour than older beef bones) on toast with an accompanying sharp and fresh parsley, shallot, caper and lemon salad to cut through the richness of the unctuous marrow. Bone marrow is of course present in all bones, but beef or veal bones are predominantly used due to their size. The long, straight femur bones are used as, being the biggest, these contain the most marrow and are the most easily accessible. Though beef bones are by far most common, the Chinese have a ‘pig tibia soup', and Iranian and Lebanese cuisines often crack open lamb shank bones as a treat at the end of a stew. The texture melts away into a sauce or onto toast like a rich, beefy, almost nutty butter. As with all meats, choosing organic and free-range will get you a higher quality product. This is especially relevant for bone marrow. As it is mainly fat, there is very little room to hide in terms of flavour. Plus, it's a very inexpensive product, even when buying the best quality possible. Look for bones that have been nicely cleaned by the butcher that are very pale pink in colour – spots of blood are acceptable on the surface. The central section of the bones contain the most marrow, but as you can’t tell exactly how much you’ll get until you cut them open, it’s always good to buy a little extra. 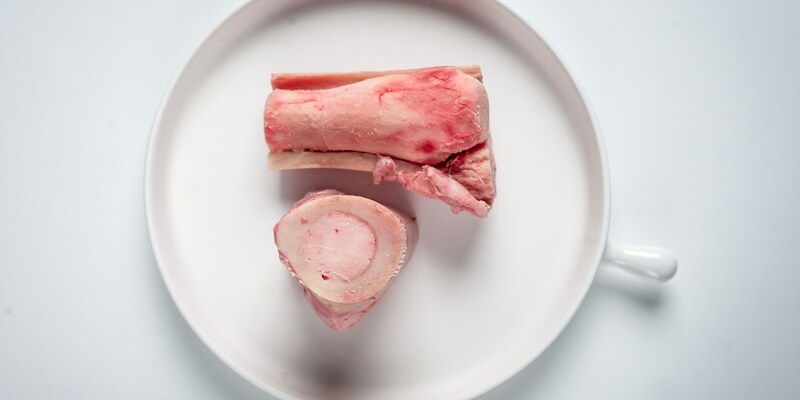 Ask your butcher to cut the bones for you – a horizontal cut makes for nice presentation if you want to stand the bones upright, or ask for them to be cut vertically for easier access to the marrow (particularly helpful if you’re using the marrow to enrich a broth). Not only is marrow cheap, it’s also surprisingly quick and easy to cook, and is delicious simply roasted in the oven with just a liberal pinch of seasoning. Add a smoky flavour by wrapping in foil and cooking over a hot barbecue, or spread the marrow over a toasted bun for an extra rich, luxurious burger. To add flavour to your marrow, pan-fry in butter with shallots, garlic, herbs and a squeeze of fresh lemon before returning to the bone, as Mark Hix does in his recipe. Below is a simple recipe for roasting bone marrow in the oven, perfect for serving on toast. Ingredients with a strong umami flavour work well to enhance the richness of bone marrow. Think anchovy, Stilton, Marmite, miso or confit shallots. As with Fergus Henderson’s parsley salad accompaniment, pair with fresh, sharp flavours to cut through the fattiness. Due to its silky texture and depth of flavour, marrow is used to enrich broths all over the world, from the Italian osso buco to the popular Vietnamese soup pho. Leyla Kazim’s recipe of Bún bò Huế is similar to pho, but uses pork instead of chicken stock and plenty of beef bones to give the broth a richness. Pascal Aussignac uses bone marrow to fry tarragon and mushrooms in his beautiful beef fillet recipe, while Claude Bosi gives surf and turf a twist by pairing turbot with gently poached bone marrow.